I arrived in Brunei today on a ferry from Labuan Island. I left Kota Kinabalu at 8 a.m. and reached in Labuan at 11 a.m. I went through Malaysian Immigration, boarded the next ferry and left Labuan at 12:30 p.m. and finally arrived in Muara at about 2:00. I took a bus from Muara to Bandar Seri Begawan (about B$2) at the ferry terminal which was about 45 minutes. Cabs are very expensive so try to avoid them if you're alone. Hungry and thirsty after traveling for 7 hours, I ate at the first food joint which I saw and it was Pizza Hut. How ordinary you would think but their menu is totally different from ours since most of our pizzas in Manila have pork and Brunei is a conservative Muslim country (no alcohol, no discos and pubs, etc.). I took the roasted garlic chicken pizza, really good! They should bring those pizzas to Manila. After a few minutes, my friend Rewandi (an ex-PY from SSEAYP 2002) passed by for me. And in my rush to the car, I left my camera on the table! I found out only at Wandi and Yati's apartment and Wandi assured me that it was totally safe in Brunei. Yup, I was able to get my camera back. As Wandi told me, when you leave stuff on the table, more often than not, it's still there when you come back for it. I was surprised people just left their cars running when they went down to get stuff. And these aren't just ordinary cars mind you. People in Brunei are known to sport the latest car models. 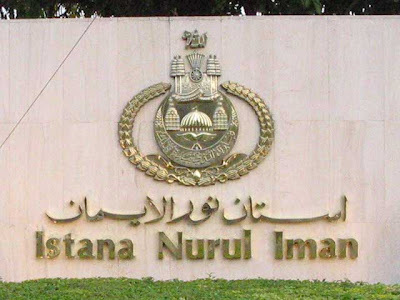 We then left to pick up his wife Yati at work (also an ex-PY 2002) and proceeded to Yayasan Complex, the most popular shopping area of Brunei. 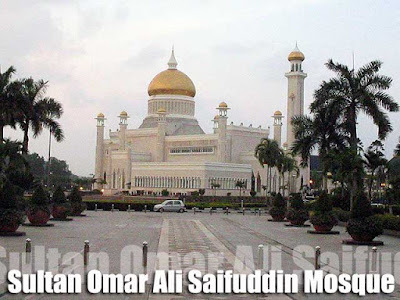 Beside it is the Sultan Omar Ali Saifuddin Mosque, a royal Islamic most considered one of the most spectacular in the Asia-Pacific Region. 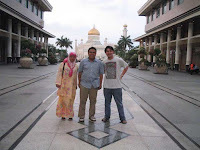 After chatting with Wandi and Yati, I discovered more than the well known fact that Bruneians don't pay taxes. Education is free and the government gives you an allowance to study. Health services and medication are free as well and the government would even send you abroad if you need specialized treatment (surgery, chemotherapy, etc.) and it's all paid for by the government! If you are a government employee, you can get a 0% interest housing loan (in the Philippines, you get charged a high interest rate which is where our corrupt GOCC officials get their benefits). The list just goes on and on! Sigh! I thought everything was more expensive here in Brunei. But I found something which was much cheaper here than in the Philippines... gas! Yes people, gas here is still P15 per liter, the perks of an oil-producing state. I hope our government officials stop that self-interest thing and get Malampaya working to its capacity! And to think all this only started to peak when Brunei became independent in the early eighties. I saw the Sultan's first palace and it was nothing but a wooden house which would have been a sorry sight if put beside our own bahay na bato. But look at the current palace, splendid, sprawling and elegant! For dinner we had sate and wet fried noodles. I missed satay so much especially that peanut sauce which accompanies it. 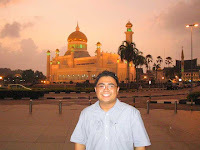 Part 3: I saw the Sultan of Brunei! I came across your cool blog while doing some research for my upcoming solo trip. I intend to fly to Kota Kinabalu, then travelling to Brunei via ferry. Is it tough to get the ferry tickets? Are there more than one trip per day (in case i don't get a ticket for the earlier trips)? And is it the same from Brunei to Kota Kinabalu (via Labuan)? Would like to ask if a visa is required when entering Brunei from KK. Thanks. Hi ivan, where in Brunei did you stay? Do you know any cheap but good hotels that you can recommend? 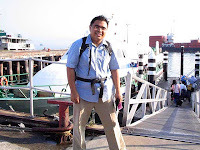 Hi Ivan, where did you ride the ferry from KK to Brunei? When is also the time of departure from Brunei to KK?